I am slowly getting into the mood again. After the 2 weeks break, I find it difficult to get into the mood to blog. So pardon me if my post seems shorter than usual. ...before I put my fingers to rest (as they are getting clumsier on keyboards). 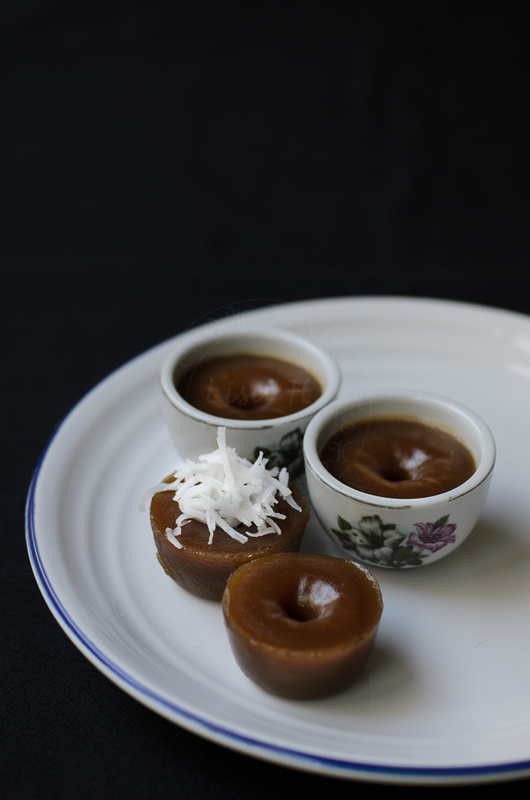 I bring you this Malaysian favourite afternoon delight called kuih lompang (steamed rice cakes). Hopefully next week, my mojo will return and I’ll write a post of my trip home. 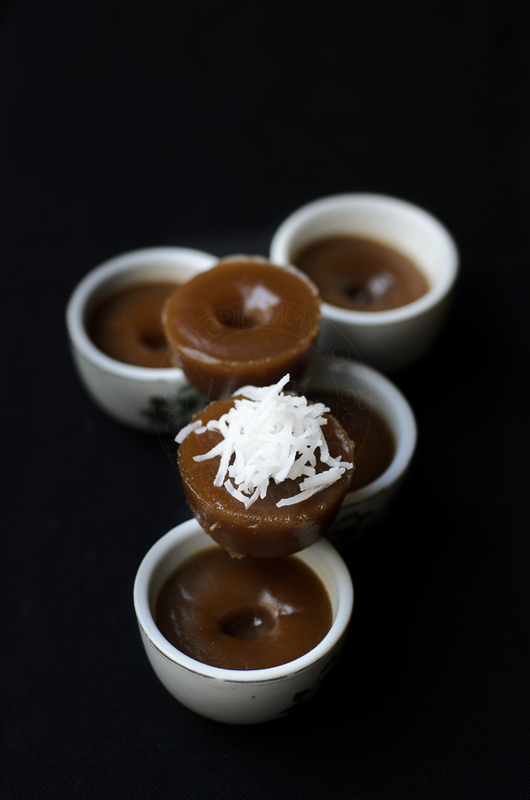 In a small saucepan, mix dark brown sugar, water and knotted pandan leaves. Bring to boil, then lower the heat to a simmer until sugar dissolves. Set aside for 30 minutes (while waiting for dark brown sugar syrup to cool). Mix desiccated coconut with hot water and salt. Add syrup to flour mix. Prepare steamer and making sure enough water. 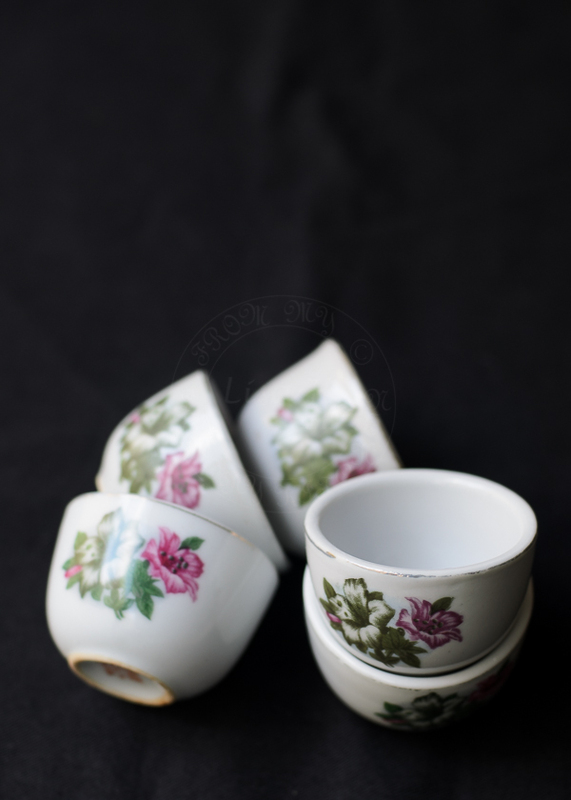 Arrange empty Chinese teacups in the steamer, steam the cups for 5 minutes. Using a small ladle, stir the flours-sugar mixture, ladled into the hot teacups. Cover the steamer and steam on high for 15 minutes. 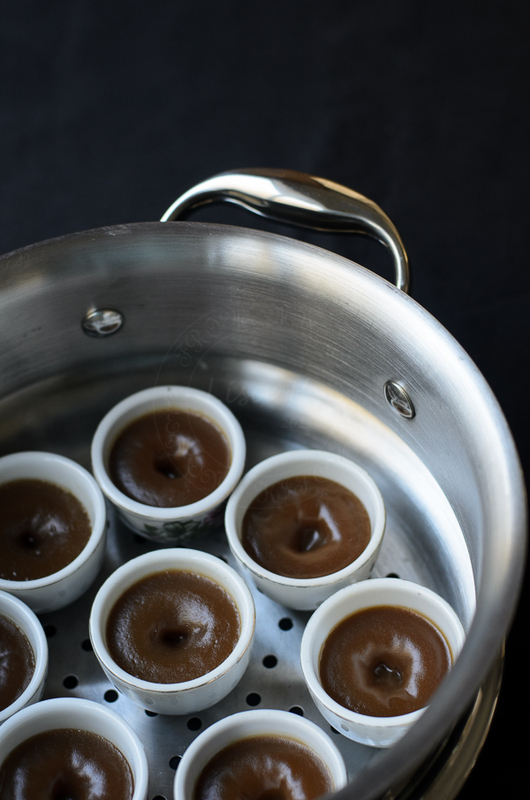 Allow the kuih/ steamed cakes to cool before removing rice cakes from the teacups. To remove rice cakes from teacups : use a thin knife, goes round the cup and gently ease it out. Gorgeous pics, mouthwatering sweets, thanks for sharing. I have always wanted to make this kuih however the last time I made it didn't turn out well. It was just too gluey and I couldn't unmould it nicely. I shall give your recipe a go soon. Love the idea of omitting alkaline water in this kuih. Thanks for sharing. They look so beautiful, Lisa. I love that you have made these in the small tea cups..so gorgeous!